If you like chocolate and you know you do and you haven't had one of these Deathcakes from Cupcake Royale, get off your bum and get one NOW. They are delish! For $6 you can get this awesome cake made with layers of single-origin chocolate decadence, espresso ganache, and chocolate cake drenched in dark chocolate ganache. Only available until Valentines day so hurry before it's too late! ps. 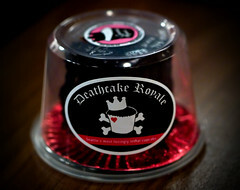 There's a post on the Metroblogging site with some of my deathcake pics.